Discriminating early-onset bipolar disorder from attention-deficit/hyperactivity disorder (ADHD) is especially important because of the differential treatments and course of illness implications involved. ADHD is treated pharmacologically with psychomotor stimulants (short- and long-acting amphetamine and methylphenidate preparations), antidepressants (atomoxetine and bupropion), and alpha-2 agonists (clonidine and guanfacine). In contrast, early-onset bipolar disorder is treated with lithium, anticonvulsant mood stabilizers, and atypical antipsychotics for initial mood stabilization1,2 and only secondarily with stimulants for residual comorbid ADHD symptoms, which are highly common in those with early-onset bipolar disorder. Thus, we wanted to identify some of the earliest symptoms portending an eventual diagnosis of bipolar disorder compared to ADHD to further supplement the reports of Sala et al.5 and Uchida et al.6 A prospective study would be ideal, but it would take many years to complete and require a large number of participants to yield definitive data. Therefore, we chose to reexamine parental retrospective ratings of symptoms that emerged in each year of their child’s life in those interviewed children with a definitive diagnosis of either ADHD or childhood onset bipolar disorder at an average age of 9 years. Initial discriminating symptoms from this cohort were presented by Luckenbaugh et al.7 In the current study, we extend these observations to include a focus on the earliest appearing symptoms and their distribution at age 5 years, as well as the total number of symptoms and their rapidity of accumulation. In this new analysis, we report on clusters of emerging symptoms that were beginning to be differential and report that the total number of symptoms associated with dysfunction was much higher in those who went on to have childhood onset bipolar disorder compared to those with ADHD. The methods were previously presented in Luckenbaugh et al.7 and are only briefly outlined here. Outpatients were recruited for participation from a Clinical Research Center within the Division of Child and Adolescent Psychiatry at the University Hospitals of Cleveland. The parents of patients gave oral and written informed consent for participation in the evaluation, associated interviews, and rating scales. In addition to the Schedule for Affective Disorders and Schizophrenia for School-Age Children – Present and Lifetime version diagnostic interview, parents rated the severity (range, 0 to 3) of 37 symptoms in each previous year of their child’s life based on the degree of associated impairment in the child’s usual family, social, or educational role related to that symptom. Twenty-two children had a diagnosis of ADHD without a comorbid mood disorder and 14 had a diagnosis of bipolar illness with an onset of illness prior to age 9 years, with 11 of these also having a comorbid ADHD diagnosis. We chose to examine this group of children with prepubertal onset of bipolar disorder (P-BP) (occurring prior to age 9 years) rather than adolescent onset to have them closely match the age and age of onset of illness of those children with ADHD. The control group included 26 children with no diagnosis on the Schedule for Affective Disorders and Schizophrenia for School-Age Children-Present and Lifetime version. The cumulative incidence of the 37 original symptoms from the full data collection and the 12 symptoms previously observed to discriminate P-BP from ADHD and symptom clusters for mania, depression, anxiety, behavioral dyscontrol, and ADHD were analyzed using linear mixed models. The symptoms of moderate or greater severity emerging in patients were then plotted over each year of life. The controls were not plotted because their number of dysfunctional symptoms was negligible. The number of symptoms was examined using a full factorial, fixed effects linear mixed model, where diagnosis was a between-subjects factor and age was a within-subjects factor. A first order autoregressive covariance structure was used with restricted maximum likelihood estimation. Significance was evaluated with a two-tailed alpha of .05. Bonferroni simple effects tests were used to examine group differences by age when an interaction between diagnosis and age was significant. 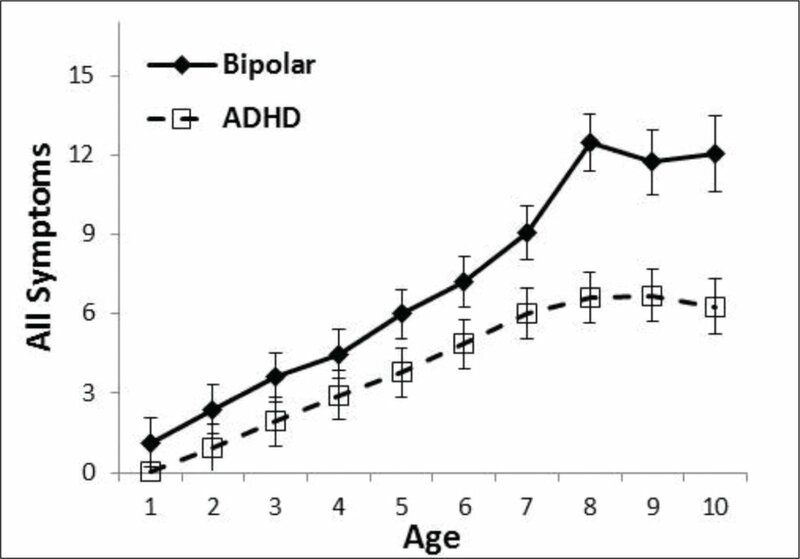 Figure 1 illustrates the earlier age of onset and more rapid accumulation of symptoms in children with bipolar disorder (mean age of onset = 4.6 years) from those with ADHD (mean age of onset = 5.1 years). A linear mixed model showed a significant diagnostic difference across the age span (F1,35 = 8.63, P = .006). Patients with bipolar disorder had significantly more symptoms. There was no significant interaction with age (F9,209 = 1.56, P = .13). Even with the diagnostic difference, the ADHD group appeared to have an increasing number of symptoms over time, so using the full set of symptoms would offer challenges discriminating between groups. Greater accumulation of symptoms in prepubertal onset of bipolar disorder versus attention-deficit/hyperactivity disorder (ADHD). Twelve symptoms were previously shown to discriminate these patient groups; these included brief and extend elevated mood, irritability, decreased sleep, physical complaints, change in appetite, night terrors, bed wetting, periods of sadness, inappropriate sexual behavior, suicidal thinking, and poor frustration tolerance. A linear mixed model showed a significant diagnostic difference (F1,35 = 26.17, P < .001) and it showed a diagnosis by age interaction (F9,203 = 2.35, P = .02). Patients who were bipolar showed significantly more symptoms at age 3 years and thereafter (Figure 2). The ADHD group had a limited number of these symptoms even at age 10 years. More rapid onset and greater accumulation of the 12 differentiating symptoms: brief and extend elevated mood, irritability, decreased sleep, physical complaints, change in appetite, night terrors, bed wetting, periods of sadness, inappropriate sexual behavior, suicidal thinking, and poor frustration tolerance, and differentiated prepubertal onset of bipolar disorder from attention-deficit/hyperactivity disorder (ADHD) in the first few years of life. Figure 3 shows clusters of symptoms and their trajectories over time. The mania cluster (Figure 3A) included brief mood elevation, extended mood elevation, pressured speech, racing thoughts, bizarre behavior, and grandiose/delusional symptoms. These symptoms showed a significant diagnosis by age interaction (F9,206 = 2.13, P = .03). Patients with bipolar disorder had more manic symptoms starting at age 3 years. In addition, behavior symptoms (Figure 3B)—temper tantrums, increased aggression, irritability, and poor frustration tolerance—significantly differentiated those patients with P-BP and those with ADHD (diagnosis: F1,38 = 5.95, P = .02; age by diagnosis: F9,218 = 1.08, P = .38). (A) More rapid accumulation of manic symptoms in prepubertal onset of bipolar disorder (P-BP) compared with attention-deficit/hyperactivity disorder (ADHD). (B) More behavioral dyscontrol symptoms in P-BP than in ADHD. (C) Anxiety symptoms emerge differentially after age 5 years. (D) Depressive symptoms do not significantly differentiate. (E) ADHD symptoms are similar in P-BP and ADHD. Anxiety cluster symptoms (Figure 3C)—night terrors, increased anxiety, obsessive thoughts, and compulsive behavior—significantly differentiated the children with P-BP from those with ADHD (diagnosis: F1,38 = 6.35, P = .02; age by diagnosis: F9,197 = 1.80, P = .07), with the children with P-BP having more symptoms, but these differences emerged after age 5 years. The depressive symptom cluster (Figure 3D)—sadness, cries more easily, more withdrawn, low self-esteem, change in appetite, severe fatigue, increased sleep, excessive guilt, and suicidal thinking—did not show significant group differences (diagnosis: F1,32 = 3.83, P = .06; age by diagnosis: F9,197 = 1.27, P = .26). Similarly, the ADHD symptom cluster (Figure 3E)—decreased attention span, hyperactivity, and impulsivity—did not differentiate the two groups (diagnosis: F1,44 = 1.99, P = .17; age by diagnosis: F9,211 = 1.19, P = .31). 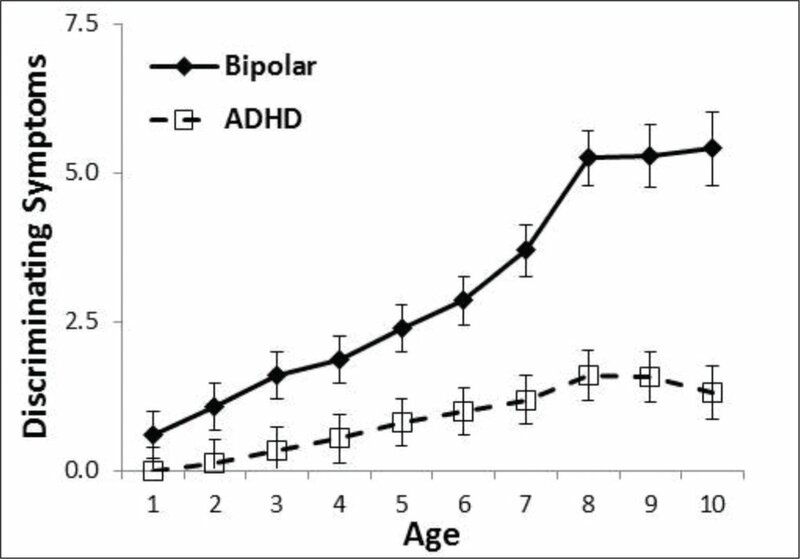 Given the high incidence of ADHD comorbidity in children with bipolar disorder seen here and in the literature,6,8,9 it is not surprising that one must look beyond typical ADHD symptoms to differentiate bipolar disorder from ADHD in very young children. As illustrated in Figure 3A, early-onset manic symptoms were the major differential. Behavior dyscontrol symptoms in P-BP exceeded those seen for ADHD (Figure 3B) and, together with manic symptoms, accounted for the earliest differences in severity of illness progression. It is noteworthy that anxiety symptoms also significantly differentiated the two groups but only after age 5 years. Depressive symptoms and, most notably, the number of ADHD symptoms did not discriminate the two groups. Early-onset bipolar disorder appears to be more common in the United States than in Europe, with approximately one quarter or more of adults in the United States with bipolar disorder having an onset prior to age 13 years compared to very low percentages in Europeans.16–20 The duration of treatment delay is inversely related to the age of onset,21,23 so many of the youngest children will have the dual poor prognosis factors of (1) early-onset illness and (2) longer delay to first treatment for mania or depression. Taken together, these findings re-emphasize the importance of a correct early diagnosis and early appropriate treatment. The clinical implications of our findings are relatively clear. In any child with an ADHD-like presentation, the physician should be alert to the additional signs and symptoms of bipolar disorder, both those described here and those consistently noted in prospective evaluations of children with bipolar disorder.5,6,8,23,24 Even very young children who will later receive a bipolar diagnosis have multiple manic and behavioral dyscontrol symptoms that are absent or very uncommon in children with ADHD. Reports from Duffy et al.27 from Canada and Hillegers et al.28 from the Netherlands emphasized that the usual progression of diagnosis in high-risk children due to a parent with bipolar disorder is that the first syndrome to emerge is an anxiety disorder, followed by depression, and then bipolar disorder (in late adolescence or early adulthood). Our data from children in the United States, where prepubertal onset is common, raise the question of a different sequence in the evolution of symptoms of children with prepubertal versus adolescent onset of bipolar illness. In the first years of life, those with P-BP show predominantly manic and dyscontrol symptoms and only later, but still early in childhood, show symptoms of anxiety disorders, as illustrated in Figure 3C. Most of the children with postpubertal or adolescent onsets,7 which were not described here, were relatively well before a rather explosive onset of their bipolar disorder in the teenage years, suggesting that the prodromal occurrence of manic and dyscontrol symptoms may be a feature of childhood rather than adolescent/early adult onsets. In our international network of adult outpatients with bipolar disorder,19 the offspring of parents from the United States also showed a higher incidence of bipolar disorder compared with those from Europe, as well as depression, anxiety disorders, and substance abuse comorbidity, suggesting the existence of at least a four generational occurrence (in the grandparents, parents, the probands, and their offspring) of more complex bipolar and other psychiatric illness presentations in those from the United States compared with Europe. In addition to the signs and symptoms emphasized here, there are several other strong indicators of a bipolar process that are inconsistent with an uncomplicated diagnosis of ADHD.5 These include the following: hallucinations and delusions, which were uncommon in this sample but are highly prevalent in other populations24; suicidal actions; homicidal threats or actions; and extremes of poor judgment and impulsivity, such as jumping out of a moving car. Although there are multiple limitations to the retrospective parental report, data presented here (as discussed in detail by Luckenbaugh et al.7) most of these potential limitations are countered by the consistency of our findings with those from clinical samples and prospective studies in children with these diagnoses.5,6,8–10,24,29,30 One limitation not dealt with adequately is the lack of attention to the recent diagnosis of severe mood dysregulation31 or its closely allied diagnosis of dysphoric mood dysregulation disorder (DMDD) in the 5th edition of the Diagnostic and Statistical Manual of Mental Disorders.32 This diagnosis, with prominent chronic irritability and a relative absence of classic manic mood symptoms, appears to be commonly associated with multiple other diagnoses in children,33 and this lack of specificity, along with an absence of data about its appropriate pharmacological management, renders dysphoric mood dysregulation disorder a somewhat ambiguous entity at this time, but one associated with a poor long-term prognosis at follow-up.34 Whether the effective treatment for dysphoric mood dysregulation disorder will follow that of complicated ADHD co-occurring with severe oppositional disorder (where stimulants and antidepressants are the usual treatments, and, if needed, atypicals) or merge with that of bipolar disorder (where mood stabilizers and atypical antipsychotics are the core treatments) remains to be delineated in future studies. Given the relatively poor prognosis of childhood onset bipolar disorder as it is too commonly approached with delayed and inadequate treatment, its better recognition and distinction from uncomplicated ADHD becomes a pressing need, especially in children in the United States where childhood onsets of bipolar disorder are relatively common. As currently approached, bipolar disorder in young children bodes poorly for their long-term social, education, marital, and economic well-being, and is associated with considerable degrees of dysfunction, disability, substance abuse, metabolic and medical comorbidity, and, ultimately, cognitive dysfunction, and loss of many years of life expectancy largely due to cardiovascular illness.3,18–22 Better distinction of childhood onset bipolar disorder from ADHD and appropriate early treatment35,36 and prevention of mood symptoms and episodes will hopefully render this fulminant and life-threatening illness of childhood and early adolescence more benign in both its short- and long-term consequences. Sala R, Gill MK, Birmaher B. Differentiating pediatric bipolar spectrum disorders from attention deficit disorder. Psychiatr Ann. 2014;44(9):410–415. Uchida M, Davis J, Wozniak J. 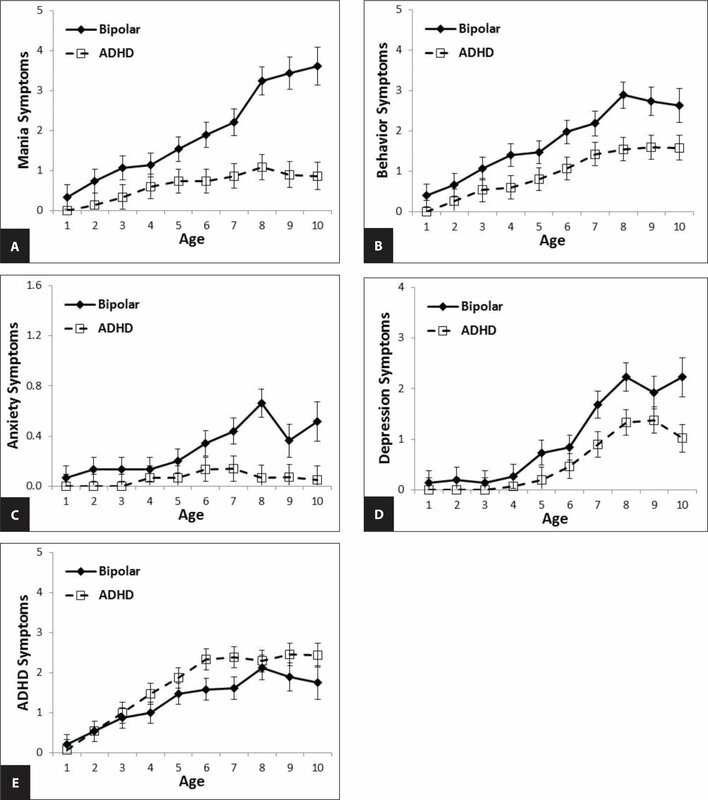 Familiarity and indicators of risk for bipolar disorder in youth with ADHD. Psychiatr Ann. 2014;44(9):423–427. American Psychiatric Association. Diagnostic and Statistical Manual of Mental Disorders. 5th ed. Washington, DC: American Psychiatric Association. Robert M. Post, MD, is Clinical Professor of Psychiatry, George Washington University; and Head, Bipolar Collaborative Network. Robert L. Findling, MD, MBA, is Vice President of Psychiatric Services and Research, Kennedy Krieger Institute; Director of Child & Adolescent Psychiatry, a Vice Chair in the Department of Psychiatry and Behavioral Sciences, Johns Hopkins University. David A. Luckenbaugh, MA, is Statistician, Mood and Anxiety Disorders Program, National Institute of Mental Health. Address correspondence to: Robert M. Post, MD, Bipolar Collaborative Network, 5415 W. Cedar Lane, Suite 201B, Bethesda, MD 20814; email: robert.post@speakeasy.net. Disclosure: Robert M. Post and David A. Luckenbaugh have no relevant financial relationships to disclose. Robert L. Findling receives or has received research support, acted as a consultant, and/or served on a speaker’s bureau for Alexza Pharmaceuticals, American Academy of Child & Adolescent Psychiatry, American Physician Institute, American Psychiatric Press, AstraZeneca, Bracket, Bristol-Myers Squibb, Clinsys, CogCubed, Cognition Group, Coronado Biosciences, Dana Foundation, Forest, GlaxoSmithKline, Guilford Press, Johns Hopkins University Press, Johnson & Johnson, KemPharm, Lilly, Lundbeck, Merck, NIH, Novartis, Noven, Otsuka, Oxford University Press, Pfizer, Physicians Postgraduate Press, Rhodes Pharmaceuticals, Roche, Sage, Seaside Pharmaceuticals, Shire, and Stanley Medical Research.